I have written few documents which visitors can download for free after social action like Like,Tweet or Plus one.These are PDF documents.Recently while browsing I found couple of these documents on Scribd.Note Scribd is one of the most popular websites on Internet.The documents were added there by different users. I thought to contact Scribd and get the document removed from the site.As the documents have my watermark it was not difficult to judge that they belong to me.This is indeed one thing you all must do.You should put a text like your website name or website URL on your documents.It makes the task easier.I use OpenOffice and / or LibreOffice for putting watermark on my PDF files.These are free software and are alternative to Microsoft Office. 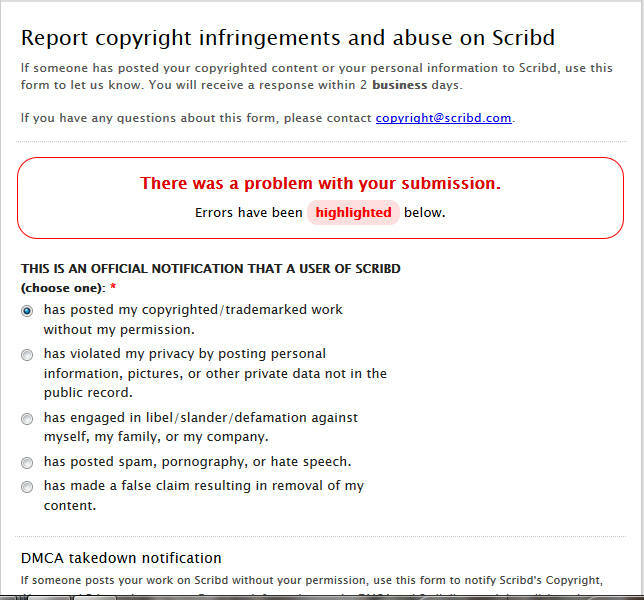 I followed below steps and was successful in getting my documents removed from Scribd within one day.I made the request in afternoon and the documents were removed in night.Thanks to Scribd team. Copy the URL which has your document and save it somewhere (like Notepad). We will be using it later in the post. Click on this link.This is link to Scribd DMCA page.On this link you will find three ways to report copyright infringements to Scribd. Filling the online contact form.The link of the form is given on the page itself.It is the bold blue link on the page.I followed this approach.I will discuss it in details later.In this approach you need to fill up an online form.It takes around 10 minutes. Second way is to mail Scribd copyright team.The mail id is shared on the above link.They have also mentioned subject line of the mail.So your mail should have similar subject line.They might ignore your mail if proper subject line is not there. You can send written communication or fax them to Scribd team.The communication address and Fax details are mentioned in above link.I am not reproducing these details here as Scribd may change the details.So it is better to visit the page for updated information. In this step we will see details you need to enter in online form method.The same details can be send as mail as mentioned in second way.So things mentioned here will be applicable to first as well as second way. After clicking on the online contact form link you will see below page.Note I have broken down the page into four parts.The screen shots are of the time I raised copyright claims. 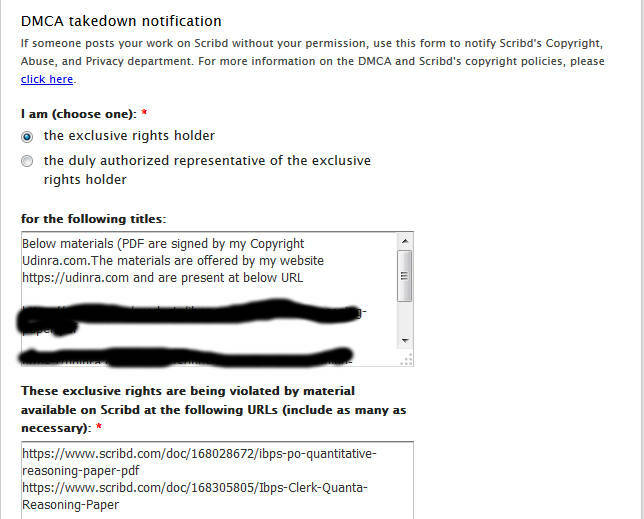 The first option (This is an official notification that a user of Scribd) asks you type of violation.You can select the type as per your case.In my case (and for most of you) it will be the first one (has posted my copyrighted/trademarked work without my permission) as shown in the image. The second option (I am) is to select your role.Are you the exclusive owner of the material or raising the complain on behalf of a person or company.In this case I was the owner so I choose the option (the exclusive rights holder). READ Are you proofreading your WordPress posts before publishing? In the third option (for the following title) you need to enter the details of materials (documents) of your site reproduced on Scribd.For example in this case couple of PDF documents on my website were reproduced on Scribd.So I wrote couple of generic sentences and provided link to both the documents on my site.You can give as many links or references as you want. 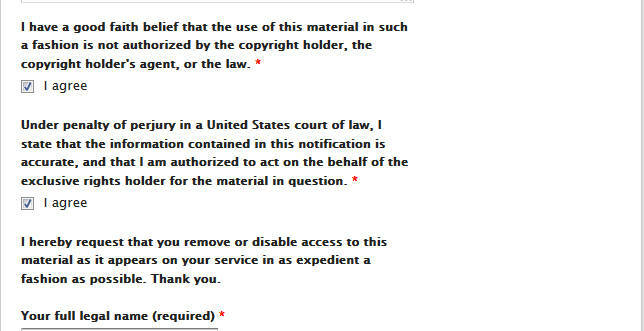 In this option you need to prove that you are owner of the materials.SO include the information which helps Scribd make the decision.In first line I mentioned that documents have my copyright information.This was strong proof that they belong to me.This is the reason you should always put watermark in your images or videos or documents. This sole information will help Scribd make the decision.Along with that I mentioned the URL of resources on my website.In my case these two information were sufficient for Scribd to make decision.You can provide additional details to make sure your ownership can be established.If you are mail option then make sure to include details as mentioned in this option. In this option (for the following titles) include link of Scribd pages which have your document.YOu should make sure that you are not sharing user profile link or other link which shows other documents along with yours.URL to your document page should be included here.As mentioned in image you can include as many URL as you want.In my case two URL had my content.If you are mail option then make sure to include details as mentioned in this option. After that you will have couple of check boxes with I Agree.You need to check these check boxes as shown in the image. Now Scribd will ask some personal details about you like Your Name and Contact Details.I did not mentioned my address while submitting the form.This is why there is warning message shown in first image of this post.So enter the details and then click submit.After submitting the details you will receive Email at the email address mentioned while filling the form.It will also show success message as well. The message contains support ticket number and link.You can add more details by replying to the mail.The mail also contains information you filled up in online form.You can check progress by viewing the support ticket provided in mail.You are notified by mail if there is any update on your ticket.So you do not have to check ticket periodically. I verified the same by visiting the URL.The document was not there. I was pretty happy with fast response from Scribd team.You can also get your copyrighted documents removed from Scribd by following simple procedure mentioned above.Do share your experience and queries? Previous Previous post: Humans.txt file Should you use it on your website ?